Starburst research has advanced our understanding of the physics behind electrogravitics and other propellentless field propulsion technologies which makes possible the design of advanced aerospace propulsion technologies that could radically change our future means of travel. Imagine flying from New York to Sydney, Australia in 15 minutes or traveling to Mars in 5 days. These should no longer be considered wishful dreams, but realities of the present that are awaiting our implementation. To move forward, to make these dreams a reality, we must free ourselves from the outdated physics theories and paradigms of the past for which such technologies are an impossibility. The Starburst Foundation is helping to pave the way to this future through its development of subquantum kinetics, the first unified field theory to predict a coupling between electric and gravitational fields. Starburst researcher Paul LaViolette has shown that subquantum kinetics provides the basis for understanding the electrogravitic propulsion experiments of Thomas Townsend Brown, Jean-Claude Lafforgue, Eugene Podkletnov, John Searl and others. Some of these technologies, such as those of Brown and Lafforgue, provide thrust to power ratios ranging from 10,000 to 300,000 times that of the Space Shuttle’s main engine. By providing a theoretical underpinning for the phenomenon of electrogravitic and electric field propulsion, subquantum kinetics lays the foundation for engineering the air and space vehicles of our future. 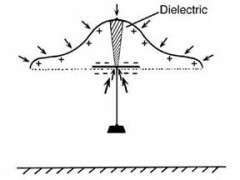 Townsend Brown’s electrokinetic flying disc demonstration. 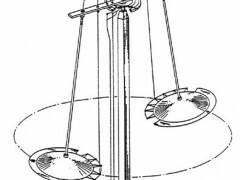 Image taken from Brown’s U.S. patent. 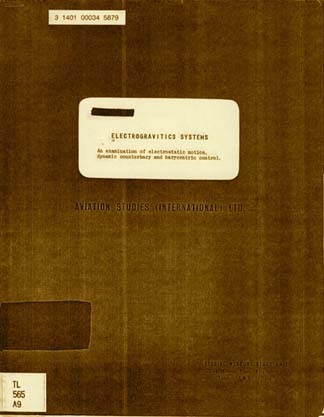 In 1985, shortly after learning about the work of T. T. Brown, LaViolette stumbled upon a formerly classified 1956 think tank report entitled Electrogravitics Systems. This incredible document, which he obtained from Wright-Patterson Air Force Base, detailed the existence of a vast R&D program in the 1950’s participated in by most of the major aerospace companies that was geared toward the practical application of this field propulsion technology for aerospace flight. Through his subsequent publications he brought to the attention of the public and scientific community the eye opening revelations contained in this report. 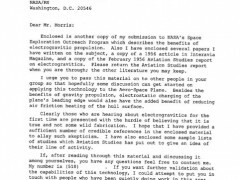 In 1990 he participated in NASA’s Space Exploration Outreach Project to inform NASA administrators about the existence of electrogravitic technology and of past aerospace industry involvement, as disclosed in this 1956 report. He proposed that NASA should seriously consider this energy-efficient means for space travel as a feasible alternative to rocket technology. 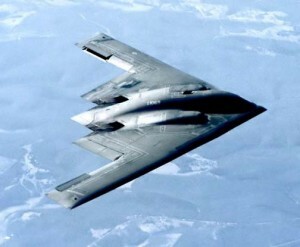 Two years later, following an impromptu public disclosure of classified information by two black project engineers, LaViolette was able to successfully reverse engineered the propulsion system of the highly classified B-2 Advanced Technology Bomber. In a 1993 science and technology conference paper, he showed that the B-2 utlized as its propulsion system the electrokinetic technology that Townsend Brown had displayed in his early 50’s flying disc experiments and whose application to aviation was detailed in U.S. patent No. 3,022,430 filed in 1956. 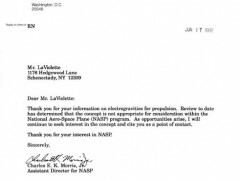 In 1992 Dr. LaViolette directly contacted NASA’s National Aero-Space Plane Project and attempted to interest them in using electrokinetics technology in their program, but without success; see letter from Charles Morris. 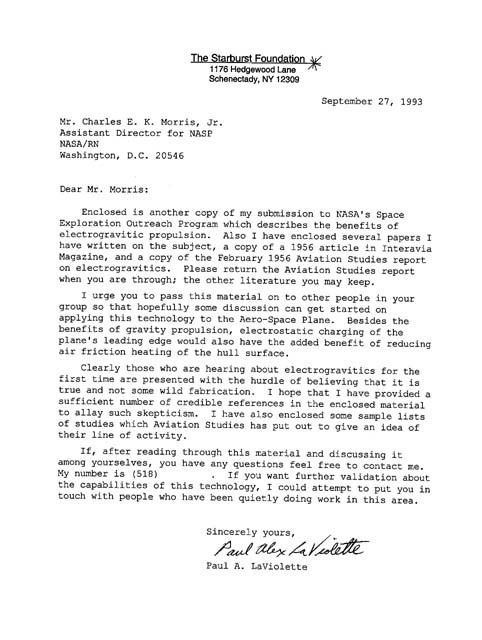 The following year he again sent a packet of material to the Aero-Space Plane Project, specifically pointing out in his letter that one of the advantages of use of this technology is that it would be able to reduce frictional heating of the wing leading edge during reentry; see second letter to Charles Morris. Again, he was unable to raise any interest even though he had acknowledged that they had a problem with frictional heating of the spacecraft hull. Ten years later in 2003, the Columbia Space Shuttle disaster occurred. The cause of the mishap was excessive heating of the wing leading edge due to dislodgment of a heat resistant tile. Had NASA implemented electrokinetics technology at the time LaViolette had alerted them, this disaster would have been avoided. 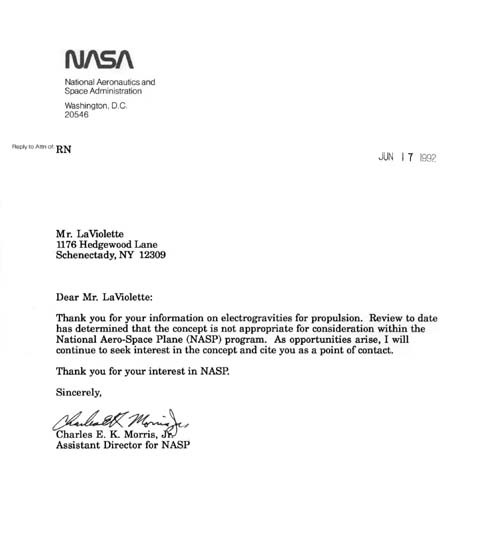 LaViolette submitted to the Columbia Accident Investigation Board a white paper informing the board about this technology and his previous efforts to inform NASA about it. As a response, he received back just a form letter thanking him for his input. ……. First Letter from Charles Morris ……. ……. Second Letter to Charles Morris ……. Dr. LaViolette has shown how the subquantum kinetics field potential concept is able to explain why an assymetrical capacitor will develop a propulsive force towards its larger electrode when energized with a high voltage potential. Standard field theory acknowledges that the electric forces on such a capacitor will be unbalanced, but leads to the belief that these will merely produce stress within the capacitor without any propulsive force. In subquantum kinetics, these field potentials are anchored in the space surrounding the capacitor (in the surrounding ether) and as a result the capacitor is free to move in response to the resulting imbalance of forces. This explains the thrust seen in Brown’s assymetrical capacitors tested by Townsend Brown as well as those tested by Jean-Claude Lafforgue. Tests of the Lafforgue asymmetrical capacitor have been carried out by Jean-Luc Naudin; see his website. These technologies routinely violate Newton’s third law.